Are Hamtramck’s police and fire departments too big? Too small? The city has already put out bid requests for the study, and the deadline for companies to respond is a couple of weeks away. The cost of the study is not known yet, but state officials have assured Angerer they will pay for it. It’s also unknown how long the study will take. The way things are going for the city – budget-wise – it needs options. The city is facing some devastating blows to its budget in the coming year. On top of the list is the likely closing of GM’s Poletown Plant, which provides about $850,000 a year to the city in lieu of paying property taxes. o Next year’s budget will not include a federal grant that currently covers the salaries of firefighters. The city had received this grant for the last several years. Angerer said the city received $575,000 for the 2018-19 budget year from this grant, but she noted the amount changed from year to year. Angerer said the city no longer qualifies for the grant because the award is only for cities with volunteer departments or cities that are adding additional employees. o A long-standing Community Development Block Grant has been reformatted, which will result in a loss of $100,000 per year that went to pay for code enforcement. o In three years, Wayne County is expected to transfer prisoners from its Hamtramck jail to the new one being built in Detroit. The upshot: A loss of $1.1 million a year. o Over the next seven years, city employee payroll will increase by 7 percent, and the total cost of their health insurance will go up by 30 percent. That will cost the city hundreds of thousands of dollars more. o According to Angerer, if the city does not make adjustments to its budget, there will be an $11 million deficit by 2023. The city’s annual budget is about $16 million. The city currently has a budget surplus of $6 million, but in order to get next year’s budget to balance, the city will have to dip into that. Next year’s budget begins July 1. Hamtramck has a history of falling into financial trouble. The state has twice stepped in and appointed an emergency manager to take control of the city’s finances. Local control was returned four years ago. This is the 3rd study of the police/fire departments. Maybe they should study the top heavy, overpaid, no results, no new development administration instead. Instead of thinking about cutting and cutting, the city should be thinking about generating more income by changing their archaic ordinances and allowing growth and economic development. But as long as ong as the same mentality is still used to run the city, bankruptcy will be inevitable. One aspect not being discussed are the proliferation of lawsuits the last few years that have culminated in payouts to both the plaintiffs AND law firms defending those actions. $100,000.00 paid to motorist Monique Mays and $25,000 paid to her passenger DeJuan Smith this year to resolve federal suits alleging police misconduct at a traffic stop. The city spent years and many thousands of dollars in legal fees to defend the two cases. The civil rights litigation involving the Hamtramck P.D.’s involvement in the COBRA auto theft/fraud unit resulted in a settlements of approximately $500,000.00 so far paid out to the families of businessmen Sam Joumaah and Sarmad “Sam” Habib – some of which has been picked up by the City of Highland Park and the respective liability insurers of those two municipalities. Ongoing legal fees are being incurred by the cities Hamtramck, Ecorse and Highland Park in defense a suit filed by Belleville businessman Ray Fayad alleging improper seizure of 90 vehicles and business equipment by COBRA unit personnel. The Jibreel Amin Montalvo suit filed by the Fieger Law Firm as the result of an alleged assault by a former City of Hamtramck police officer at a traffic stop currently is pending. Former Hamtramck Officer Ryan McInerney remains a defendant in a criminal civil rights indictment obtained by the U.S. Department of Justice arising out of the incident. The City of Hamtramck has continued to pay for McInerney’s legal defense in the civil suit via professional services rendered by the McGraw Morris law firm. We see this scenario being repeated nowadays with the Marijuana legalization issue. Clueless city officials promised a financial windfall and encouraged to agree to participate in something that will cause them to lose millions later. Fool them once, shame on you. Fool them twice, shame on us, Hamtamck’s city officials. Kerry Delaney is Mark Koroi. The Review should start posting stories on Facebook and closing comments on this website so people’s real names are attached to their comments. you do realize the irony of your comment, right? Yes, that was the point. Also, The Review lacks journalistic integrity for picking and choosing which comments it posts. I saw a comment posted that was subsequently deleted. Several other comments have been made that were not posted. but how do you know for sure that kerry is mark? you have proof? and no, not every comment gets posted for a number of reasons, including defamation, foul language and personal attacks. Not every publication allows every single comment to be printed. It is somewhat outrageous to see that the City of Hamtramck has shelled out many thousands of dollars so that former Officer Ryan McInerney has his own law firm (McGraw Morris of Troy, Michigan) defending him in a federal civil rights lawsuit by Jibreel Amin Montalvo at taxpayer expense while a separate law firm represents the City of Hamtramck proper. City Attorney John Clark initially had his office involved in placing McInerney on administrative leave in 2014 while he, McInerney, was being investigated for possible disciplinary action in connection with the Montalvo traffic stop. Clark would, as City Attorney, later act as defense attorney of record for McInerney in the federal civil rights suit filed by the Fieger Law Firm on Montalvo’s behalf. The city later paid McGraw Morris to act as McInerney’s defense counsel in that civil rights suit which they remain to the present. Separate counsel has been retained by McInerney to defend him in the criminal case brought by the U.S. Department of Justice. The City of Hamtramck did not fire McInerney after placing him on administrative leave but rather negotiated a settlement in which he resigned. McInerney later obtained employment as a railroad police officer. What this article astutely observes is that the Wayne County Sheriff may be shutting down the Dickerson correctional facility and that will create a financial hit whose impact that will certainly rival a Poletown plant shutdown. While most of the attention is focused on the Poletown facility being idled in 2020, the impact of the eventual closing of the jail has been largely ignored or even unknown to members of the public. Besides the tax impact, workers from Poletown as well as the jail also lavish their wages on Hamtramck bars and restaurants among other local businesses and thereby help the local economy. Without some effective intervention, the simultaneous impacts of the idling of American Axle and Poletown plant, the closure of the local jail, and the financial exposure caused by an onslaught of police misconduct cases will likely lead to the end of Hamtramck as a viable municipality. Look for a possible emergency manager appointment similar to the one that brought in Cathy Square – or worse – a merger with the City of Detroit with a dissolution of the police and fire departments of Hamtramck. Not necessarily, with current rising home prices in Hamtramck and hopefully a city that is willing to expedite things not stall them, all these locations can be developed into housing/commercial development and sold very easily, especially with the reconnection of Hamtramck to Detroit on the GM’s plant side. A jail, and a pollution producing plant are being closed down. We should be celebrating not lamenting these events. This is a golden opportunity if taken advantage of wisely. Chrysler Corporation in 1992 moved its headquarters to Auburn Hills and the city lost 6,000 jobs. Highland Park Community College closed in 1996. Highland Park currently was named the fifth worst city in America to reside in. It has the lowest household income of any city in the U.S. This is despite the fact Chrysler gave a generous payment to help the city as it closed its HQ and that site was later rebuilt by Canadian automotive supplier Magna into a plant (in 2009). 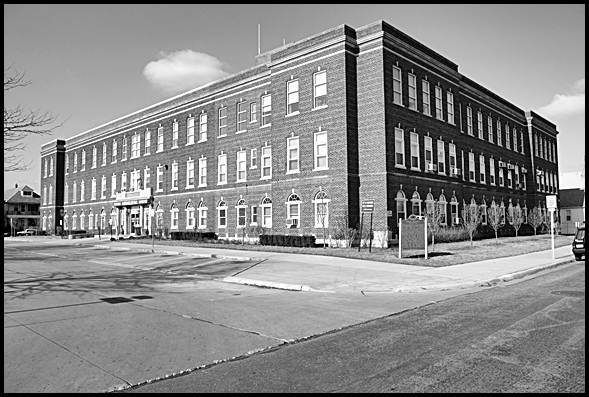 The jail facility in Hamtramck is well-built and it houses those convicted of non-serious offenses – as well as being safely away from most local residential areas. GM’s Poletown facility does not produce as much pollution as other, older, plants in to Metro Detroit area. There little doubt that the financial impact upon Hamtramck – much like Highland Park suffered in the last several decades. Hamtramck must stop these proposed closures or else face a fate similar to the residents of the City of Highland Park. First: Hamtramck is not Highland Park. There are no Hamtramck jobs being lost in the plants shutdown, only deroit’s. Second, Highland Park is rebounding without the need of these plants and factories that have left. Third, a million or two million dollars loss will not destroy Hamtramck and whatever replaces these two entities will probably generate more income to the city than they currently produce. The mentality of “The sky is falling” being displayed by some of the city’s officials must stop and a mentality showing trust and confidence in Hamtramck’s economy and future should be presented to the whole world. An happy to utilize them for residential and commercial development. Imagine driving down Joseph Campau street all the way to downtown Detroit in 10 mins. Dodge Main closed, Hamtramck survived. American Axle closed, Hamtramck survived that too. GM closes, Hamtramck will survive. x 2000 property tax per house = $4,272,000 per year. A win win situation for Hamtramck. And that’s not taking into consideration permit fees, water fund balance increase, tickets income, increased economic activities and commercials activity these residential developments will generate. Some clarification is in order regarding former Officer Ryan McInerney and the COBRA organization since posts continue to be made that reference those topics. Yes, lawyers G. Gus Morris and Christopher Raiti of the McGraw Morris law firm – experts in defending allegations police misconduct – in Troy are defending Ryan McInerney in a federal civil suit at city expense even though he is no longer employed by the City of Hamtramck. This defense benefits the City of Hamtramck as the city is a defendant in that case and McInerney not having competent legal counsel can prejudice the city’s position in that action. Secondly, COBRA – which is an acronym for Communities Opting to Beat Rising Theft – was a highly successful multi-jurisdictional law enforcement unit comprised of officers assigned by the police agencies of Ecorse, Hamtramck and Highland Park. Hamtramck joined COBRA under the direction of former Chief of Police Max Garbarino and it continued to operate under the administration of Anne Moise until its dissolution a few years ago. Ecorse, Hamtramck, and Highland Park – all cash-strapped communities – combined into COBRA for the concurrent purpose of generating revenues for the treasuries of these respective municipalities. The COBRA organization – and many similar units formed throughout the State of Michigan were funded by the Auto Theft Prevention Authority(ATPA) – a public state body that received its own funding via auto insurance companies transacting business in Michigan. According to public disclosed information contained in the 2016 ATPA Grant Performance report, COBRA received an ATPA grant for that fiscal year of $172,064 and recovered automobiles and other property totaling $925,005; 107 vehicles were recovered and 15 auto theft arrests made. Revenues were realized by the unit through forfeiture proceedings and each participating municipality received monetary distributions commensurate with such participation. Hamtramck turned a “profit” by its own participation. Hamtramck P.D. policy does not allow its personnel to make public comments on pending legal matters so little has been said to the media in defense of COBRA by police personnel. Nevertheless, COBRA and its officers will have their “day in court” and are entitled to a presumption on innocence as to any claims that may be made against them. The payouts for lawsuit settlements referenced above have been largely motivated to avoid the daunting expense of federal litigation and the city’s exposure for these monetary settlements have been significantly been mitigated by contribution by the city’s liability insurance carrier. Jibreel Montalvo – as I have posted earlier – had been under COBRA investigation and served time under a plea agreement for resisting arrest and receiving a stolen vehicle. These convictions are matters of public record and verifiable via the Offender Tracking Information System (OTIS) located under the Michigan Department of Corrections portal at the state’s website. Chief Moise has earned the respect and confidence of Hamtramck P.D. personnel serving under her command by standing by and advocating for officers whose conduct has come under fire – the public should be giving similar support for these brave officers. Do you know any developer or builder who would be willing to develop and construct a new subdivision within the City of Hamtramck? It is a pipe dream. The former Chrysler Corporation headquarters in Highland Park was demolished following its closure and it took over 15 years before Magna Automtotive rebuilt the site. The 400,000 square foot Sanders Confectionery HQ in Highland Park was vacant since its 1994 closing until it was heavily damaged in a fire a few years ago. If Hamtramck would be as lucky as Highland Park was to eventually find another business to come in and commence operations at one of the sites – such as American Axle – then the city should be jumping for joy. You are an optimist and I am a realist. The “silent majority” of Hamtramck citizens appreciate the officers Hamtramck P.D. for their unselfish role in protecting the community from violent criminals. Look to Highland park and Detroit to see the difference in crime rates and it is the “thin blue line”of our police department personnel that makes that difference. Do you know how much is the price for a standard average vacant lot in Hamtramck? Even if no development was realized. Just be selling the vacant properties as empty lots, money generated by the sale and subsequent taxes will easily cover the loss of GM and jail taxes. I predict that if the city clears these vacated properties, subdivides them in to vacant lot and offer them for sale that they will be sold in less than a week. As a test run, the city could offer all the vacant properties it’s holding currently ( for whatever mysterious reasons) for sale and see how long and how much they get for them. What vacant properties are you referring to? Do these lots have any significant value that would motivate the City of Hamtramck to sell them? property taxes alone will be around 100,000 per year if appraised correctly plus the a sale of value of around a million if sold.